JHAPA, Nov 30: An accident prone section of the east west highway has not been repaired even though it has claimed many lives. 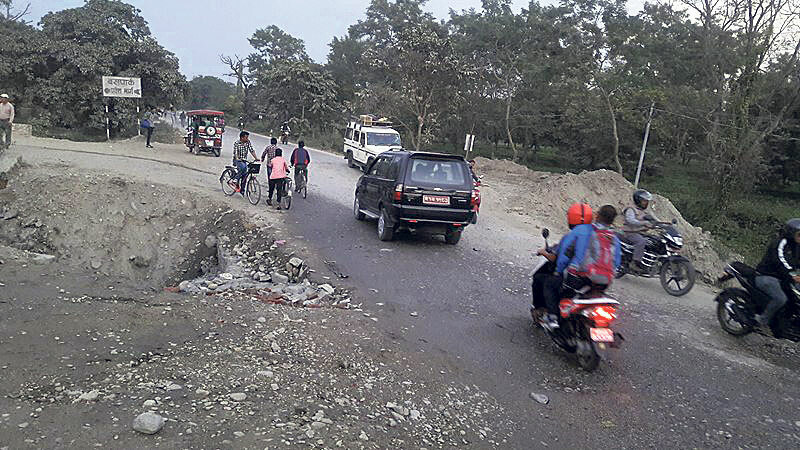 Locals lament that the road section in Birtamod, Jhapa has been triggering accidents on a regular basis and yet has failed to draw attention of the road department. “This road section has become very much unsafe. Accidents are regular occurrences here,” said Dhundiraj Giri, chief of Jhapa Traffic Police Office. “Since the last few weeks, incidents of road accidents have increased along it but still the road department has not repaired it,” he added. Locals put the blame on road department officials. “Things wouldn't have been in such a sorry state if the officials were honest. When the government fails to monitor contractors, they simply don't deliver the tasks in the expected way,” a local from Birtamod said. Requesting anonymity, he added that contractors are like gangsters, who keep things and officials in control by bribing them. “The whole process is driven by commission. Concerned officials award contract to contractors who are close to them and are willing to give a cut from the project budget. In such a scenario how can you expect to see real development take place in the society?” he said in a satirical tone. Hundreds of vehicles ply through the highway every day. Though it was in poor condition last year, this year its condition deteriorated further. Giri said that the gateway to Birtamod Buspark has become more of a accident trap for vehicles. “Most of the accidents whether four or two wheelers, occur here. It's certainly like a death trap,” he said. To avert further tragedies he urged road department authorities to repair the road immediately. “On Sunday a motocyclist died in an accident at the spot. Such tragedies will continue to take place until and unless the road condition improves. But it seems that the road department does not care about it at all,” Giri said. Sunday's accident victim, Thamsingh Limbu, 34, of Duwagadi had met with an accident at the spot after he lost balance and fell into the sinkhole. Though he was rushed to a nearby hospital immediately, he did not survive. “Like Limbu, many motorcyclists have lost lives because of the sinkhole on this road,” Giri informed. He stated that traffic police has been facing problems in managing vehicular movement and ensuring safety along the road. Giri added that it is hard for the traffic police to provide round-the-clock service at the road section as they don't have sufficient manpower to do so. Locals have protested several times against the road department's apathy. They have taken to street, chanted slogans and demanded immediate repairs many times. Just recently, they organized public discussion on the issue and handed over a memorandum to the municipality office and the office of the road department. “But nobody has responded to the call though the road continues to kill,” said Bishal Bhurtel, a Birtamod resident. “The government has shown no response even when a major highway is out of gear and killing people,” he fumed. The road section was badly damaged by this year's rain. During July-August a portion of the concrete road was washed away by the flood. Because of it the road section had sank down by four feet than the general road level. Though transportation along the road resumed after a week of minor repairs, the road department did not level the sink hole. Upon pressed for a reason to neglect the issue, Yadav did not show willingness to share one. He avoided the question summarily stating, “All I can say is, we are going to work on it and complete it soon.” He also declined to comment on public's charges that 'road department favors irresponsible contractors because responsible contractors do not consider fulfilling personal interests of the department's officials'. 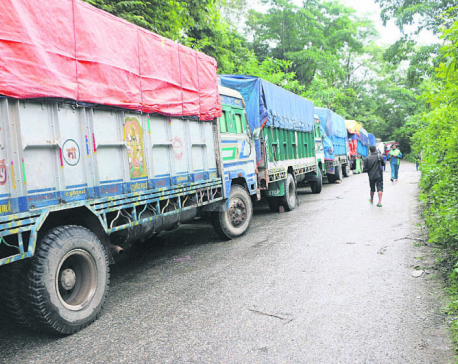 Photo caption: Vehicles ply nearby a sinkhole on the east west highway near Birtamod, Jhapa in this recent picture. Despite repeated accidents at the site, the road department has not shown urgency to repair it.